District Court of Chandigarh. Interested and eligible qualifications having persons can submit their application in prescribed format to District & Sessions Court Judge Chandigarh on or before 22-02-2017 by 05:00 Pm along with all required documents self attested. Selection for Chandigarh District Court jobs will be through written Test and computer proficiency test. 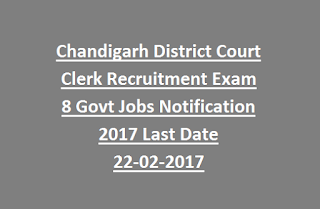 For more details of Clerk jobs in Chandigarh District court see the below given information. Last date to submit the application form is 22-02-2017 by 05:00 Pm. 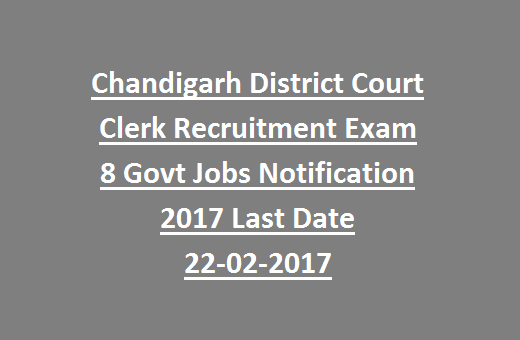 Total 8 Clerk jobs available in Chandigarh District Sessions Court. As on 01-02-2017 candidates age limits are 18-37 years. For SC/ST and OBC candidates reservations are applicable as per Chandigarh Administration. For SC/ST/BC and Ex Serviceman reservation are applicable as per the norms of Chandigarh District Court. Must have passed Matriculation with Punjabi/Hindi is one of the Subject. Must have qualified a Bachelors Degree from a recognized university. Selection for this Clerks jobs will be held through written test and computer proficiency test. Written test will be conducted for 100 marks. Those who got the 40% in both topics they are only eligible for the Computer Proficiency Test. Candidates can download the application form from the official website of E Courts of Chandigarh. Or application form is available in the official notification. Fill all the information and attach photo as per given space. All educational certificates self attested copies and 2 Pass port size photos attested by Gazetted Officer to be attach with application form and submit it to The District & Sessions Judge Chandigarh on or before 22-02-2017 by 05:00 Pm.